Cables: MIT Magnum M1.3 interconnects & speaker cables, MIT Magnum digital cable, Sablon Audio Panatela interconnects and speaker cables [in for review], Wireworld Equinox 6 interconnects & speaker cables,Transparent Audio Performance USB cable. 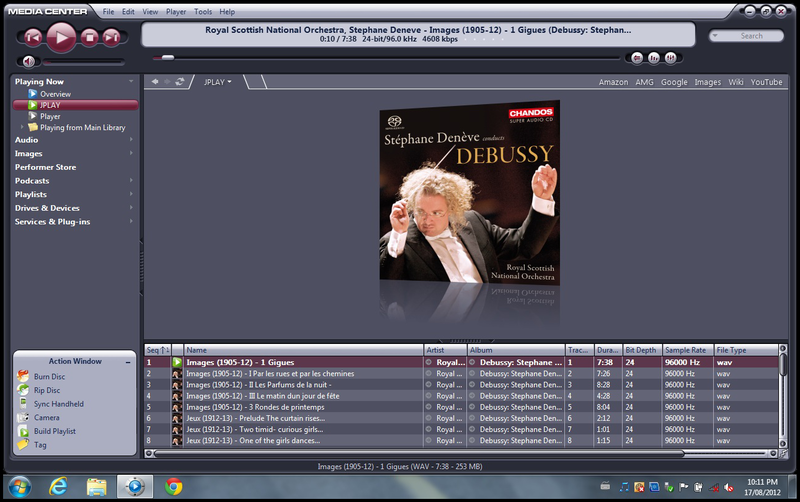 If you had told me three years ago that I would be reviewing computer software let alone use a computer for music playback, I’d have laughed in your face. Well - fat chance of that happening today. My current digital source is a Windows laptop because it simply sounds better than my now little used CEC transport. And the subject of today’s review is indeed a computer software program. What has surprised me during this time is the rapid improvement in sound quality of computer-based music playback. In itself this is startling since computers are multi-tasking multi-use devices where little if any attention is paid to the fidelity of their music playback. Then there’s the rapidly exploding availability of standard Redbook (16-bit/44.1 kHz) and higher resolution (24-bit/88.2 kHz and up) downloads. 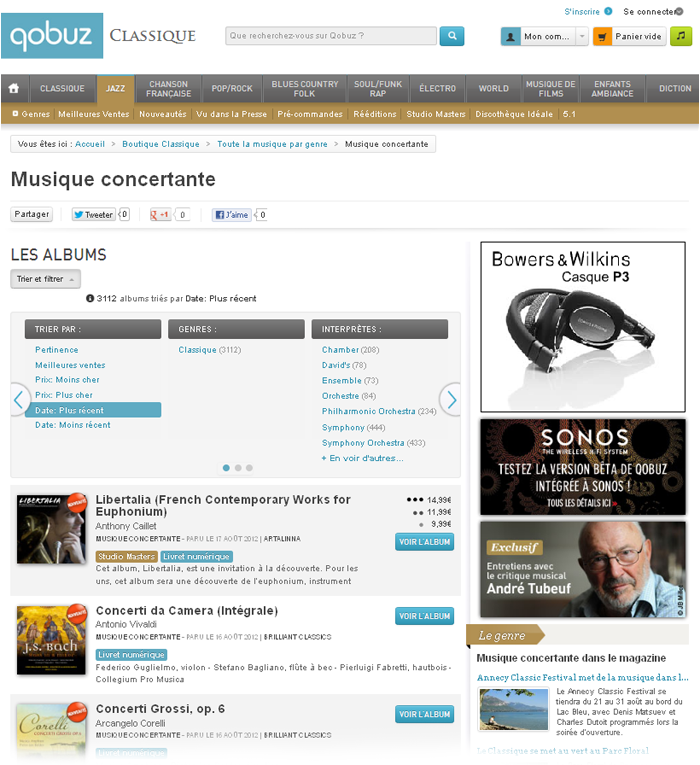 Presto Classical for example offers Naxos 16-bit/44.1kHz albums for about $7 Canadian. I can’t even buy the physical disks for that price let alone find a brick ‘n' mortar shop that carries a decent variety. And these downloads include the liner notes. Qobuz.com and eclassical.com also continue to be go-to sites for music downloads and are often far less expensive than discs. Who still needs physical digital media? Magnetic based storage and playback of music is here to stay. It has awesome potential to enhance the listening experience as well as our options and convenience to obtain, store and play back recordings. A key caveat in my view is the bewildering array of storage and playback schemes. There are computers, servers, library management and playback software, network-attached storage (NAS), streamers, wireless, wired… the options are seemingly endless. So are cost and complexity. Until this rapidly developing product category finds direction and stability and starts to offer affordable upgradeable easy-to-use solutions, I’m sticking with an inexpensive laptop, a decent playback program and the best DAC I can afford. I’m not exactly thrilled about having a computer hooked up to my system but it does presently give me the best of all worlds without burning up my credit card. I’m also fairly computer savvy and generally at ease with computers. Incidentally, I wouldn’t go anywhere near one of those so-called audiophile music servers. Those are little more than overpriced computers with no, little or outrageously priced expandability options. Having said that, Widealab’s Aurender S10 looks positively smashing to me even at its $7.000 price tag. For music library management and playback I use J. River Media Center 17 which is the best of its kind I have found thus far. It’s easy to use, customizable and has cool audiophile features such as memory playback, automatic sample rate switching and DSD support. Check out Chris Conaker’s detailed review. His site is one of the better ones I’ve found regarding computer audio as is Michael Lavorgna’s Audiostream. Other worthy places to scope out for tips on enhancing your computer playback experience include this, that, thot and the other. Several months ago while reviewing John Kenny’s excellent JKSPDIF Mk3 and JKDAC32, Kenny pushed me to try JPlay, a simple non-GUI music playback program with a tiny memory footprint. I held little initial interest as I was content with J. River’s obvious sonic improvement over Foobar and iTunes and was reluctant to add another variable in the middle of a review. Eventually I downloaded the freebie demo however and was surprised that music was clearer, more palpable and dynamic than over JRMC.